Looking for 311 Series Backshell? SEE and COMPARE the benefits of EA Series 4800 Competitive Products! The Electro Adapter Series 4800 Adapter design is a fast and economical way to terminate an over-all shield to connector termination. An EMI/RFI shield from a cable is secured between a male and female lamp base threads providing a shield termination joint. Strain relief is attained by only the shield. Strain relief saddle bar clamps are an option, available with Straight, 45°, 90° and 90° Split Shell Configurations. This clamp secures the shield and cable jacket to the circular backshell. Shrink boot attachments are available. 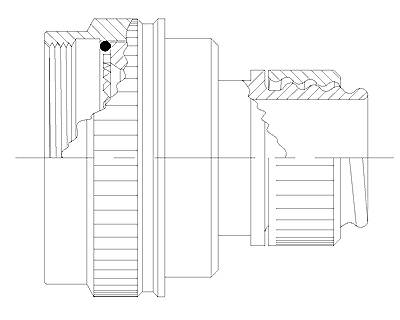 Spin Coupling or Self-Locking Coupling. From the earlier evolution of backshells this termination is designed to accept ‘Nut’ or an alternative ‘Clamp’. The threaded rear nut allows for the use of an overall heat shrink boot and the clamp alternative (without the boot) gives strain relief clamping after the shield and cable are terminated. 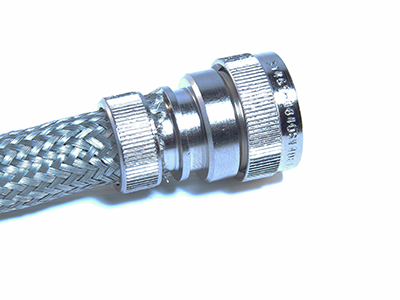 The use of a shrink boot does aid in moderate environmental protection for the connectors inboard side due to moisture inclusion. Later, Gland Seals were developed internal of the backshell itself to exclude moisture.